Maintaining your tools is important to the quality of your work, longevity of your equipment, and your safety. 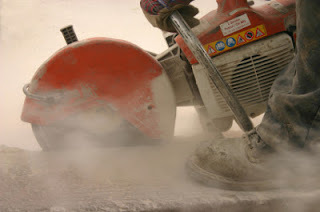 This is especially important for power tools, which can pose a serious risk of injury if they aren’t operating properly. Keeping your cut off saw blades sharp will prolong the life of your saw by making it easy for a saw to cut and putting less stress on the engine. Safety-wise, this will also help reduce kick-back from the blade snagging. Find a soft, abrasive material that you can make a few cuts into. A concrete block or a brick will work great. Get a hose and run water over the area of the block you will be cutting. It’s best to have someone hold the hose for you, or secure the hose in a way that doesn’t require you to hold it. Don’t try to hold the hose and cut at the same time. Make a few cuts into the block or brick while water is running over it. This will create an abrasive slurry that allows the dull diamonds and metal to be stripped away, exposing the new diamonds. You want to be sure you are cutting at least 2 inches into the block so it will wear down the blade enough. Stop your saw and check the blade after the first few cuts to see if there are exposed diamonds. It’s hard to estimate how long this process will take, since it depends on how dull your saw is, the exact material you’re cutting into, and the blade you are using. If your blade has reached the steel, it’s time for a new blade. Check your owner’s manual for more information on how to replace the blade and what size and type of blade you need. HLSupply carries a wide range of parts for cut-off saws from leading manufacturers including Husqvarna, Stihl, and Mikita. Browse our store to see our entire collection of cut-off saw, chainsaw, and small engine parts at low prices.